The most promising challenge in front of any organization today is to reduce its human resource costs and optimize utilization of its resources in order to maximize outputs and profits. This makes C2W’s Managed HR services as the most important success factor for any organization. It takes significant amount of time and resources to execute human resource operations in-house. This may hamper concentration on other core business activities that are more important, be it bringing business into the organization, delivering products, goods or services or delivering effective customer/client communication. If you are considering opting for Human Resource Outsourcing to decrease your costs and enhance your efficiency, trust CONNECTING2WORK’s Managed HR Services. As your company evolves and changes with times, maintaining an effective human resources department that scales in relation to the size of your employee base can become a challenge. Outsource some or all of your Human Resource operation’s requirements to CONNECTING2WORK and spend more time and resources focusing on other important business processes. In fact, by leveraging Mynd Integrated Solutions expertise and relying on our range of HR outsourcing solutions, many clients discover that they can save 30 percent or more over the cost of maintaining a full staff of people in an in-house human resources department! In the evolving outsourcing and technology services scenario, we are the change agents. As employee champions and organizational navigators, our HR outsourcing services are the expert hands in which you can place your HR processes and challenges. With enhanced and emerged HR technology, we provide seamless solutions covering the complete employee lifecycle- ‘Hire to Retire’. With a diverse client base in more than 20 countries, our experience in managing service delivery across employee lifecycles via strategic outsourcing spans across multiple geographies and industries such as Manufacturing, Banking, Retail, FMCG, IT & ITES to name a few. Combined with our technology and domain knowledge, we deliver composite value in the field of human resources. Backed by a strong IT partner support, we process large number of transactions for last mile solutions, globally. 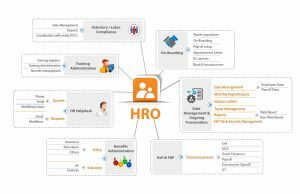 We have and do develop customized HR services, based on the type of workforce and the specific needs of our client’s business to achieve holistic and accelerated growth. 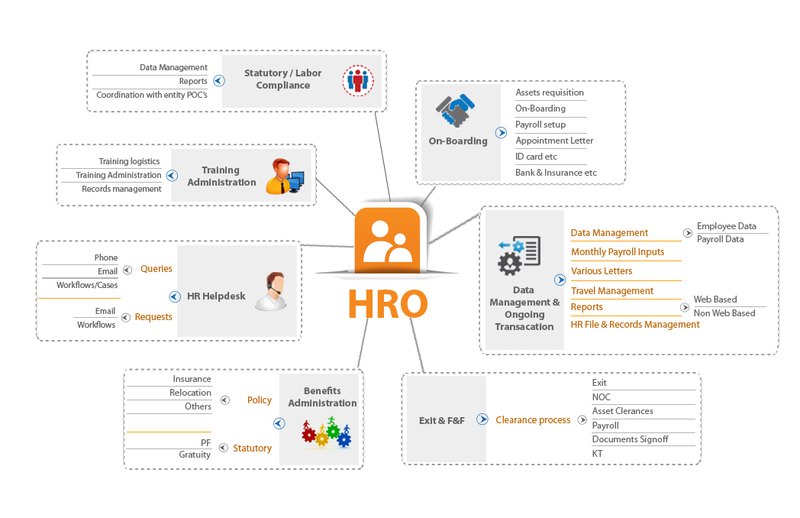 Our offerings for HR functions are modular, helping you select an offering to address a specific need, or combine offerings to create consolidated operations and realize greater value.Advances in technology and changes in the way employees access information has driven employers to rethink the way they handle this critical business component.